The campaigns can’t begin until September, but 34 parties are planning to fight for a seat. As of August 2, 34 political parties have declared their intention to run in Kyrgyzstan’s October 4 parliamentary elections. 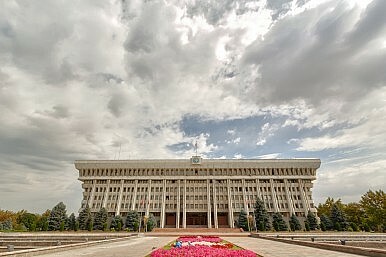 Kyrgyzstan’s 120-member parliament, called the Jogorku Kengesh, is one of the most dynamic in a region more often associated with pre-determined elections and rubber-stamp parliaments. The election campaign doesn’t begin–by law–until September 4. But it’s not difficult to imagine what will be up for discussion. In recent months, however, Kyrgyzstan democratic progress has come into question. The country’s relationship with the United States has soured somewhat, while Kyrgyzstan seems to be drawing closer to Russia–the perpetual pendulum swing in Kyrgyz politics. President Almazbek Atambaev’s recent statements have been laced with anti-Western sentiment and conspiracy theories featuring the U.S. plotting a “color revolution” in the country are popular. A pair of controversial laws–modeled on Russian laws banning “gay propaganda” and restricting “foreign agents”–and a referendum on constitutional reforms are being put on hold until the fall. They’ll likely still factor in the election with regard to nationalism, morality, and influence. It can be expected that unemployment, the Kumtor gold mine, and energy prices will make it into the election platforms as well. Everything is very simple. And it is not about procedural matters pointed by lawyers. The European Union, which promised to allocate €10 million for the holding of parliamentary elections, said to the White House [the Kyrgyz Presidential Office] that if they intend to combine the referendum with the elections, they won’t receive money. Same was said for national authorities on draft laws on foreign agents and LGBT. They also will lose €30 million for the support the budget if these laws will pass in the parliament. On July 30, Asia-Plus reported that the parliament was going to consider a second reading on the foreign agents bill. Later that day however, a subsequent report said that parliament decided to postpone considering the bill. According to Asia-Plus, deputy Ravshan Zheenbekov called on the bill’s sponsors to withdraw it, citing the negative opinion of the international community. According to an International Republican Institute survey conducted earlier this year, Kyrgyz view parliament as less corrupt than the police, but more than foreign or domestic companies. 42 percent of respondents said parliament was “very corrupt” and an additional 37 percent said it was “somewhat corrupt.” Still, 54 percent responded that they had a positive view of parliament’s work.